For nearly two decades, the 337 km stretch of the Trans-Canada Highway between Kamloops and Alberta has witnessed major infrastructural upgrades, driven largely by a demand to move more resources, more efficiently. The twinning process, expanding the highway from two lanes to four, brings simultaneous construction and destruction to the lands of the Secwepemc (Shuswap) First Nation. Major land disputes have arisen as highways, hydroelectric dams, and logging developments continue to encroach on ancestral burial sites and existing communities. 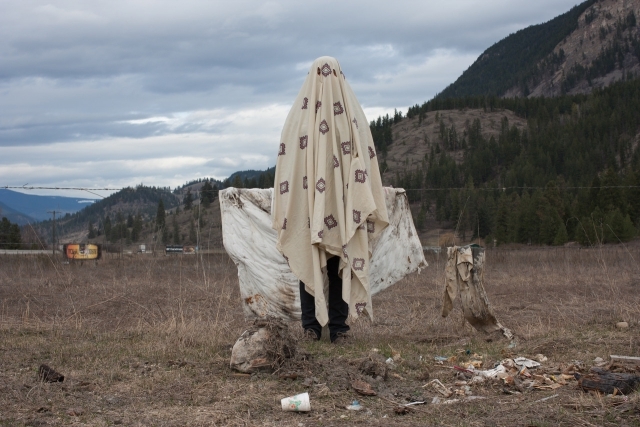 In response to this persistent intrusion of space, both sacred and lived, Secwepemc artist Tania Willard’s #haunted_hunted series (2014–15) disrupts the unquestioned motives that pave the way for these developments. 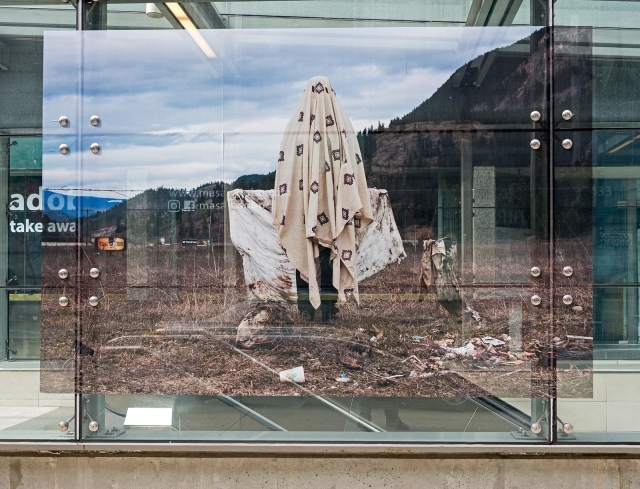 The two images on display, photographed by Secwepemc artist Aaron Leon, show a figure draped under a sheet of appropriated “native” designs. The first shows the figure occupying, and thus haunting, the landscape. Set against a white backdrop, the second image demonstrates the figure’s haunting presence in a way that resists common museological frameworks for Indigenous art. 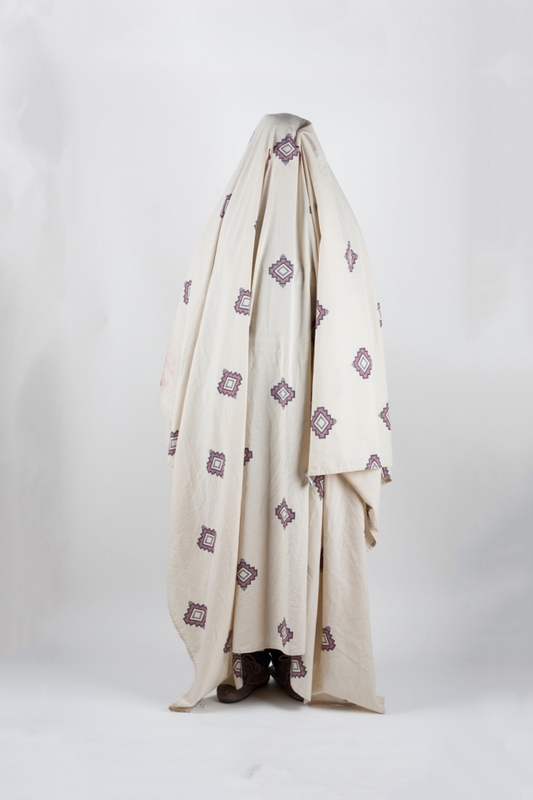 Willard’s practice addresses ongoing colonial agendas by actively navigating the shifting ideas of contemporary and traditional as they pertain to cultural politics and aesthetics. 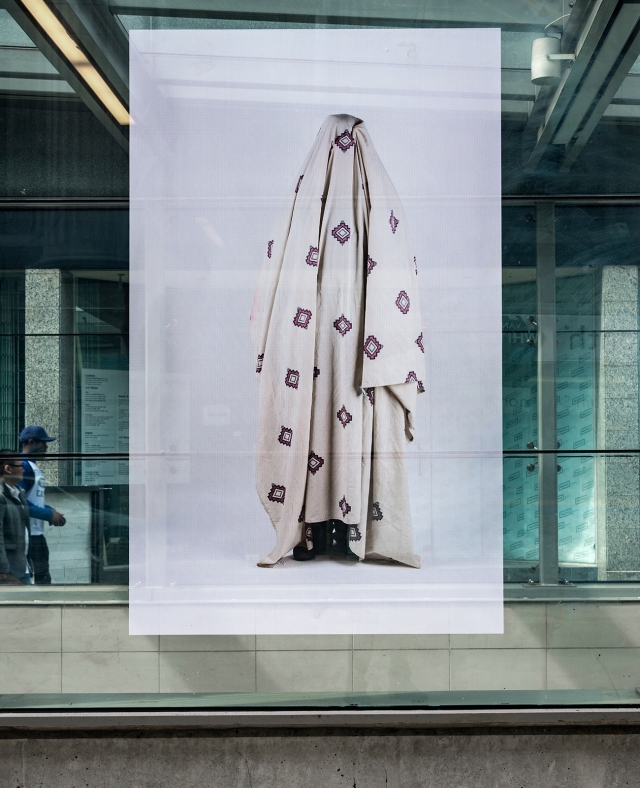 Positioned within the framework of BUSH Gallery, a conceptual space for land-based art and action led by Indigenous artists, the #haunted_hunted figure is at the same time mobile and site-specific. The addition of a hashtag suggests the reach of a digital community while remaining rooted in a tangible politics of space. 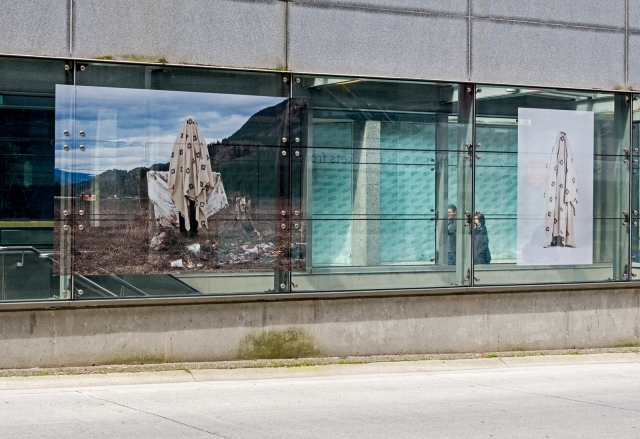 The entrance to the South Granville Station is curated by Emily Marston, School for the Contemporary Arts at Simon Fraser University.